Seventeen-year-old Violet Fairdale has one job: protect humans from dangerous fae. It’s a job she’s good at—until the cute guy whose life she just saved follows her back into the hidden world of magic. Now she’s broken Guild law, landing herself in a whole lot of trouble. The last thing Vi wants to do is spend any more time with the guy who got her into this mess, but the Guild requires that she return Nate to his home and make him forget the magical world he’s discovered. Easy, right? Not when you factor in evil faeries, plenty of mystery and intrigue, and inconvenient feelings of the romantic kind. Vi is about to find herself tangled up in a deadly plot that threatens not only her own life, but her entire world. I cry out as the boy grabs hold of my arm. I stumble on the invisible path, my mind loses hold of my destination, and I tumble out of the darkness and onto the forest floor. I don’t usually exit the faerie paths so clumsily, but I don’t usually have a human boy on top of me. I lie there blinking as the reality of what just happened strikes me like a slap in the face. And I’m the one who brought him here. “Probably the most idiotic thing you’ve ever done.” I doubt he’s listening to me though. “Well, you probably think there’s no such thing as faeries either, and yet here I am.” And here he is. In my forest. My home. I kick a flurry of leaves into the air. Their colors shift rapidly in protest, cycling through an endless palette: lavender, magenta, burgundy, sienna. I bury my face in my hands. I have so failed this assignment. I lower my hands. “Excuse me?” I’ve been called many things in my seventeen years, but ‘big’ has never been one of them. Quite the opposite, in fact. “Actually, that did kind of hurt.” He rubs his leg. “So you don’t have wings then?” he asks, completely ignoring what I just said. “No!” I’m trying to think of the best way to fix this, and I wish he’d keep quiet. “Is that what you were doing in my room?” he asks after a moment. Rachel lives in Cape Town with her husband and three miniature dachshunds. 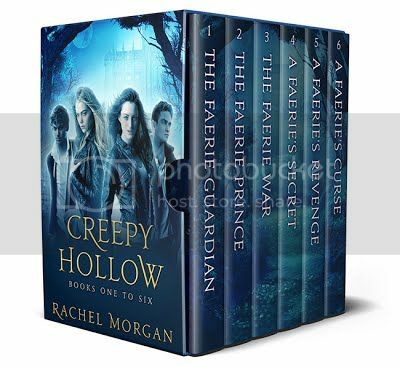 She is the author of the bestselling Creepy Hollow series, and also writes sweet contemporary romance under the name Rochelle Morgan.